Dreaming of Paradise: When is the Best Time of Year to Visit the Maldives? The Maldives is a garland of more than 1000 islands in the sunny Indian Ocean. It is the ultimate faraway island paradise where the national tree is a coconut palm and the sun always seems to be shining. And while it certainly is the crème de la crème of tropical paradises, choosing the right time of year to visit is as important as deciding where you will stay. 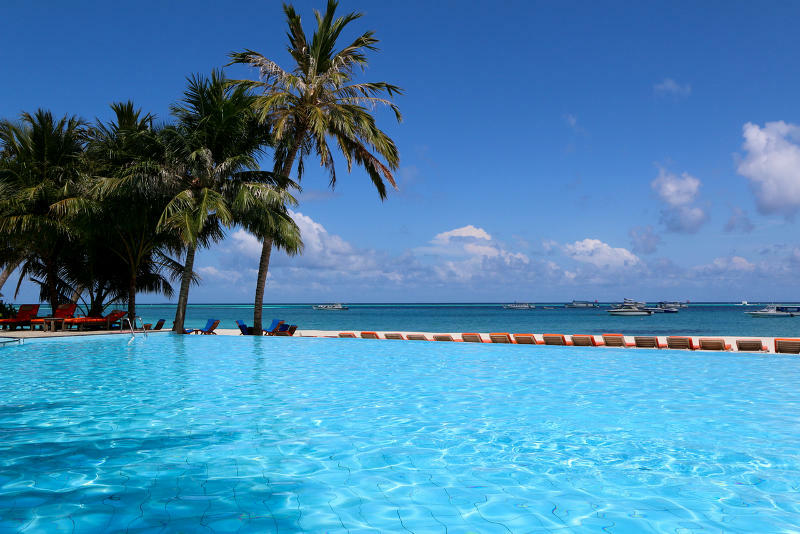 Find accommodation in the Maldives on Travelstart.co.za! 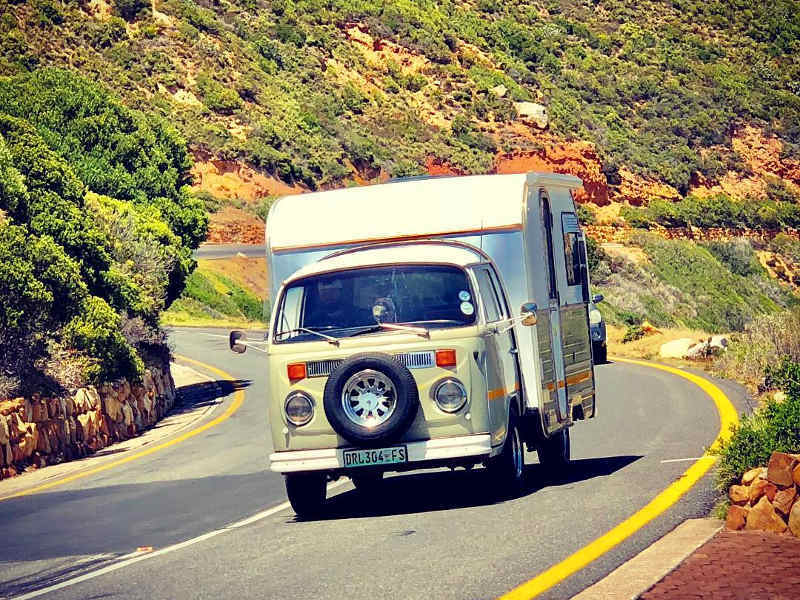 Some travellers might prefer to travel off-season when cheap flights are available in abundance, others may prefer to go when the weather is perfect and the holiday season is in full swing, and some might prefer the sweet spot when the seasons are changing and great hotel deals are aplenty. Whichever traveller you are, this guide will help you figure out what time of year is best for you based on weather, attractions, festivals, and flight prices. Located near the equator, the Maldives is graced with stable temperatures throughout the year and protection from cyclones. The average temperatures range between 23 degrees Celsius and 31 degrees Celsius. Although the weather conditions on the northern atolls can vary slightly to the weather conditions on the southern atolls, the islands have two dominating seasons called Monsoons. The dry winter monsoon “Iruvai” lasts from November to April and the wet summer monsoon “Halhangu” spans May to October. The winter monsoon brings deliciously sunny skies and occasional rainfall, while the summer season brings heavy rainfall, rough seas, and strong winds. The southern atolls experience slightly more rain than the northern atolls. 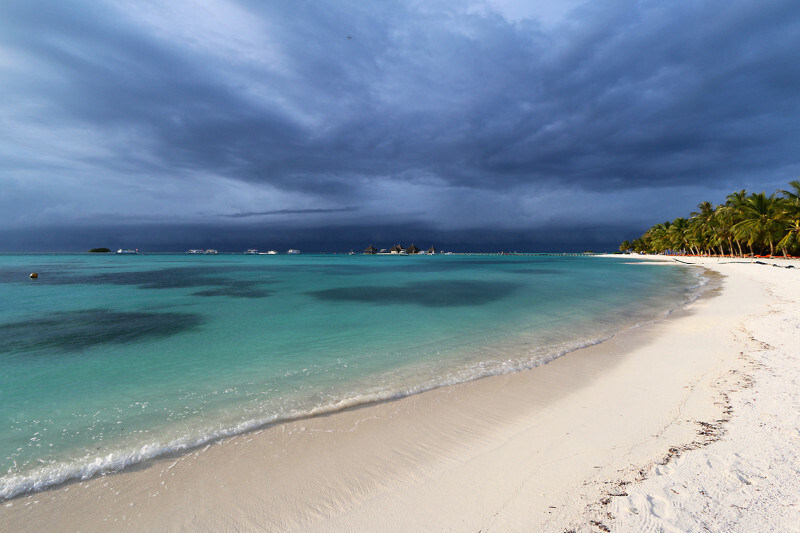 The weather in the Maldives is notoriously moody. Clear skies and sunshine can be replaced by grey skies and rainfall quite suddenly, before you’ve even had time to take a sip of your Tequila Sunrise. Note: Weather is unpredictable and cannot be accurately predicted for more than three days in advance. 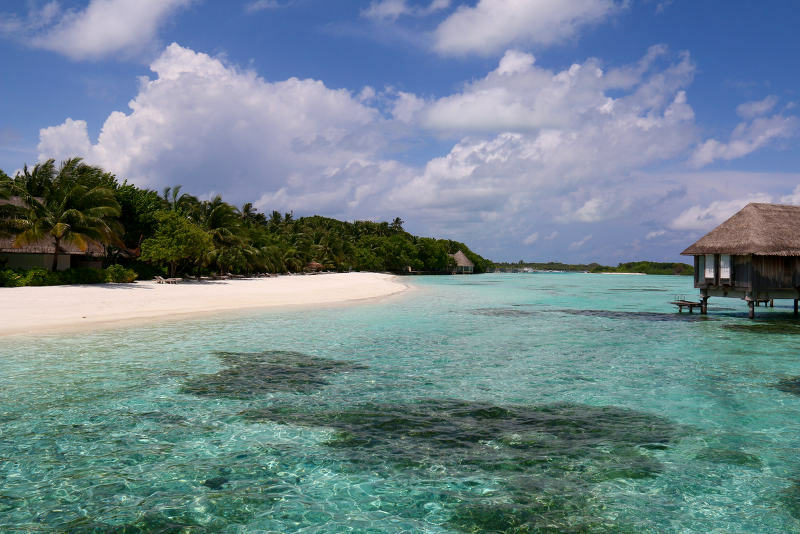 This information is based on historical data and general weather patterns in the Maldives. The driest period outside of the monsoons is between January and April. 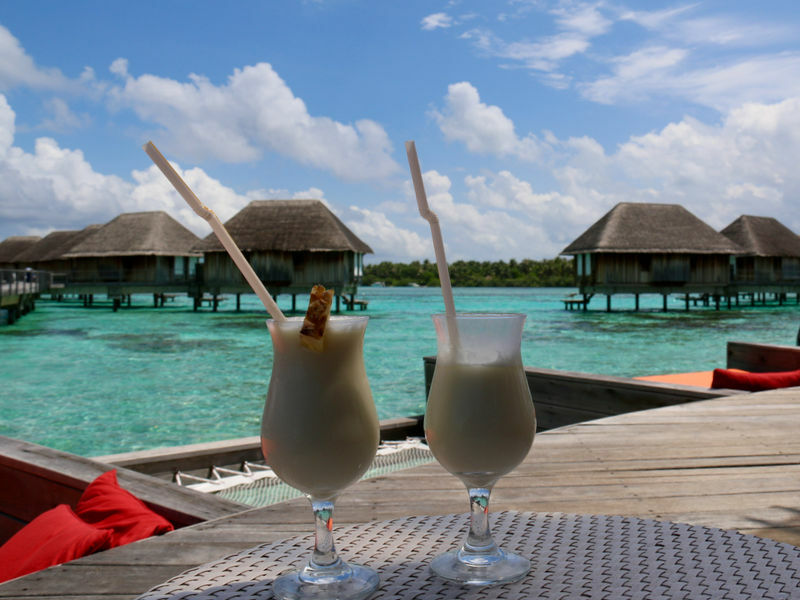 This is generally considered the best time to visit the Maldives. 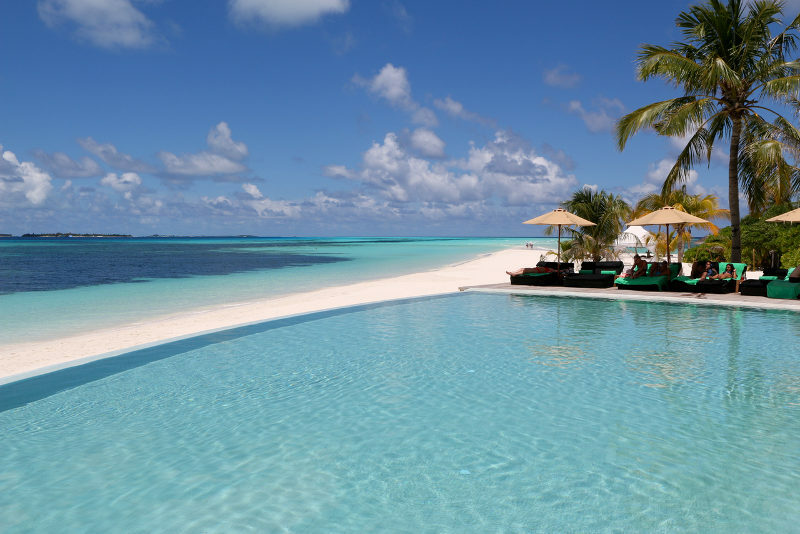 The best time to find great hotel deals and cheap flights to the Maldives is between April and November. The surfing season is from March to October. 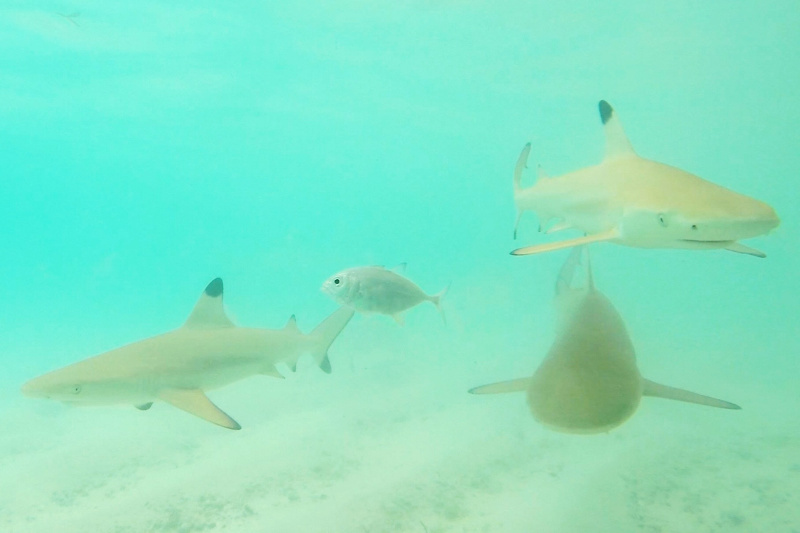 The best visibility for diving is from December to March. The best time to swim with manta rays and whale sharks is in May. The peak holiday season is from December to March. The peak honeymoon season is from November to April. Light waterproofs during the rainy season. Some resorts may require men to wear a shirt and trousers as evening wear. The Maldives is a Muslim country so dressing conservatively in Malé and small villages is considered polite and respectful. Note: Try to pack light for your trip to the Maldives. 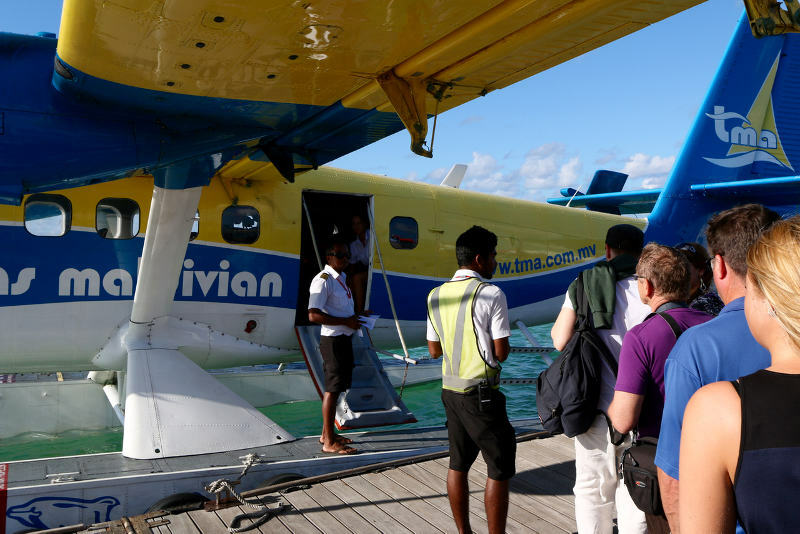 Seaplanes usually have a baggage allowance of about 25kg and charge for additional luggage. Sunrise is usually around 6am and sunset around 6pm, which means the Maldives experiences about 12 hours of daylight throughout the year. It just wouldn’t be a tropical nirvana without warm ocean lapping against the soft shores. 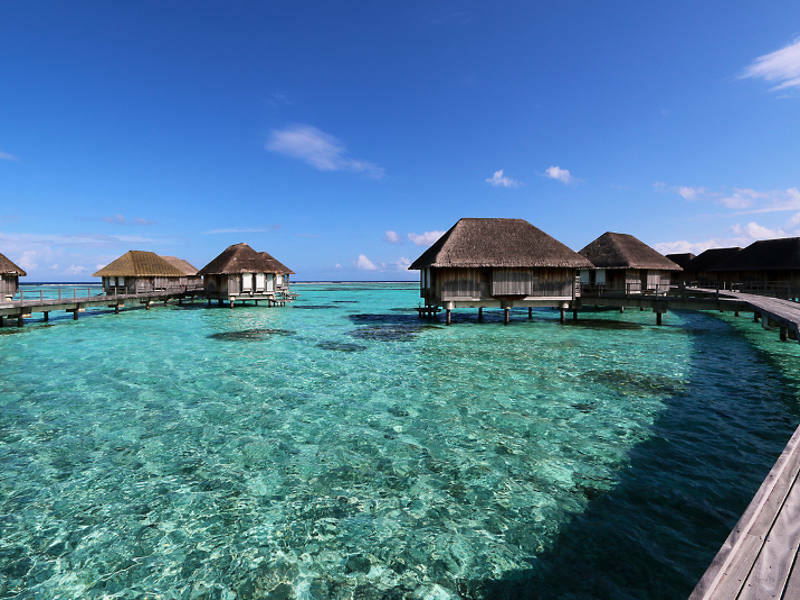 Luckily the Maldives is blessed with ocean temperatures that range between 24 degrees Celsius to 35 degrees Celsius throughout the year, which means it truly must be the ultimate island paradise. Peak holiday season in the Maldives is not for the budget conscious. Travelling during the high season means hotels and resorts will be a lot more expensive and flights will cost at least 30% more than during the low season. 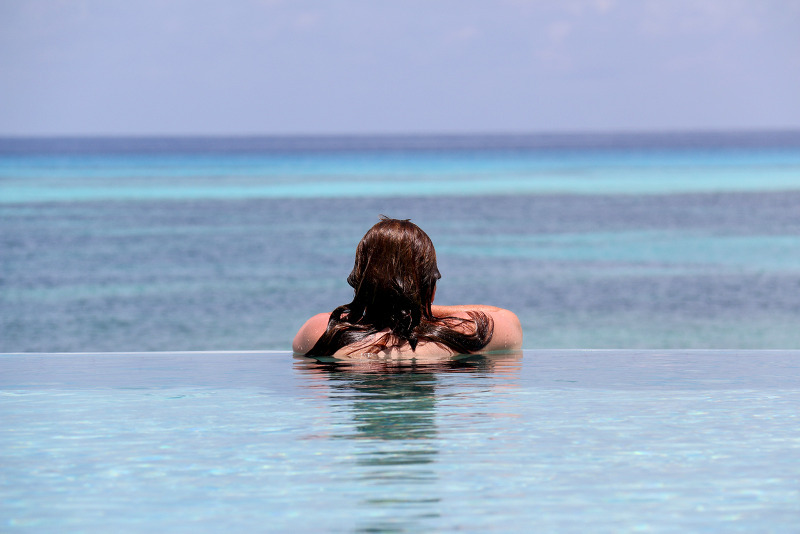 If you want to experience the blissful tropical weather and experience the Maldives at its best, it is worth spending a bit extra to travel during the high season. You can save up to 30% on flights to the Maldives and save as much as 80% on hotel deals by travelling during the off-season. The average number of rainy days during an off-season month is between 10 to 15. 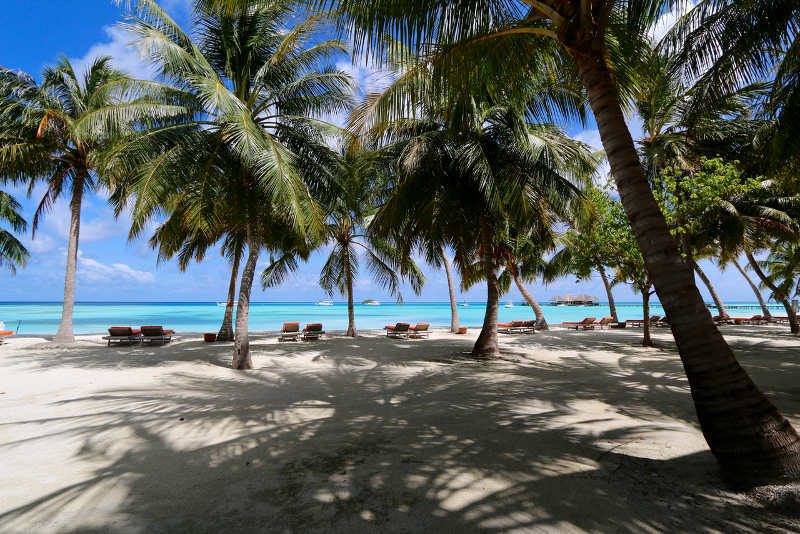 Although the weather can be lousy, the Maldives generally has 6 to 8 hours of sunshine so it won’t be all doom and gloom if you decide to travel during this time. Find and compare cheap flights to the Maldives on Travelstart.co.za! The events and festivals in the Maldives are mostly national occasions or religious celebrations. They are usually deeply special events on the Maldivian calendar and can offer a remarkable glimpse into the soul of the islands and its people. This annual music festival charity event is held by Kurumba Maldives in support of the Kudhakudhinge Hiyaa Orphanage and Maafushi Island Education & Training Centre. Dancing on the beach to local music, bodu beru performances, and art create the ambience for this celebration with a good cause. This is a particularly boisterous time on the islands as the locals celebrate the day the Maldives gained independence. Colourful parades of marching and dancing flow through the streets and Republic Square becomes a grand celebration when the sun goes down. This annual festival is a collaboration between marine biologists, conservationists, artists, schools, and local communities to celebrate the marine diversity surrounding the islands and the sacred relationship between the islanders and the ocean. Celebrations take the form of storytelling and local craftsmanship. Also known as Fithru Eid, this is a 3-day annual festival that marks the end of Ramadan. Traditional dances such as the bodu beru are performed with gusto and merriment fills the air. 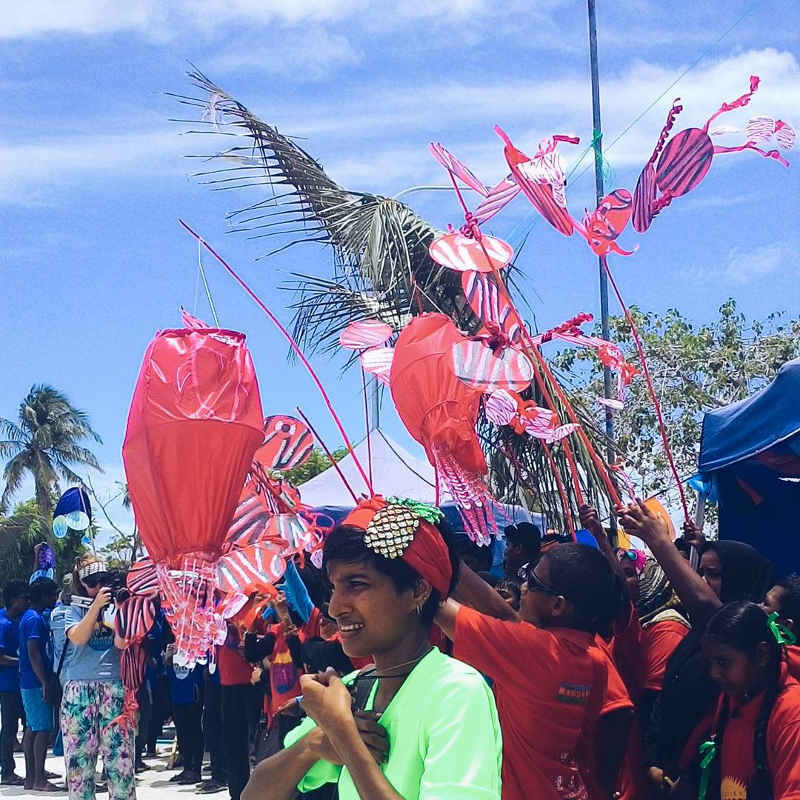 Visitors to the Maldives can usually witness these colourful celebrations in the streets. Fishing is the lifeblood of the Maldives and Fishermen’s Day is a tribute to the local fishermen’s contribution to the economy. 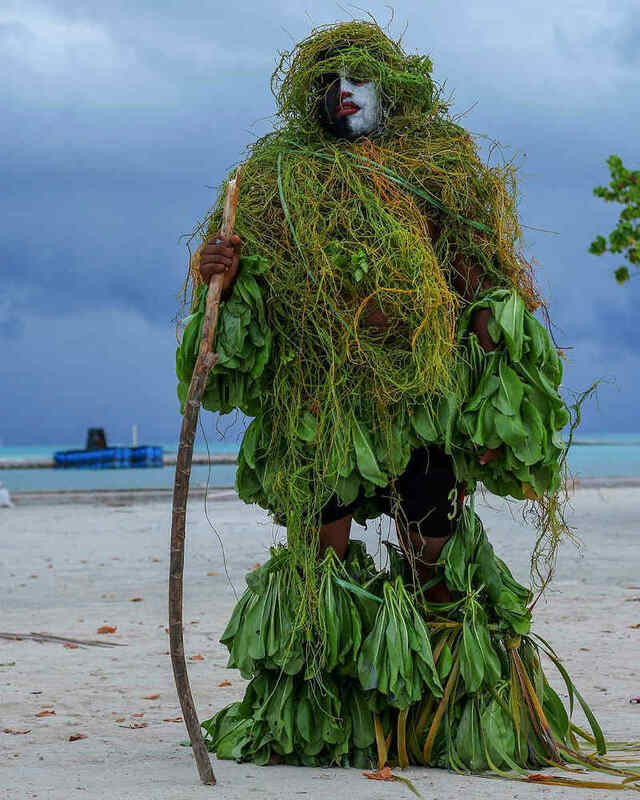 The festival is an intimate peek into the lives of the islanders and a chance to indulge in fresh skipjack tuna and frigate mackerel while learning about traditional fishing methods. Remember, these celebrations are deeply sacred events on the Maldivian calendar and should not be treated as just another photo opportunity. It is important that you respect the local culture and traditions while travelling and ask locals for permission before taking photographs of them. The best time to visit the Maldives for cheap flights and great hotel deals is between May and October and the best time to visit if you want great weather and amazing activities is between December and April. December to April is the high season so hotel rates and flights will be a bit more expensive. 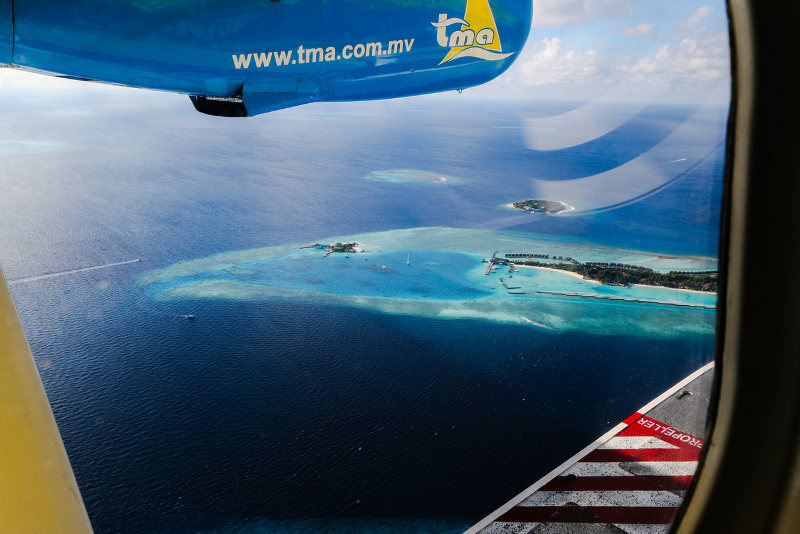 If your trip is still a pipedream or unplanned, you can stay in the loop with the latest flight specials to the Maldives and travel articles by signing up for our newsletter. You can also find great travel deals on our holiday packages page. If you have already travelled to the Maldives or another amazing beach destination, share your stories in the comments below!